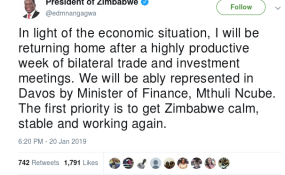 The tweet in which President Emmerson Mnangagwa announces he is returning home early from his trip to Europe. Zimbabwean authorities will hold opponents "fully accountable" for the unrest, and a spokesman described the deadly crackdown as "just a foretaste" of the future. President Mnangagwa has cut short a foreign trip. The government of Zimbabwe is set to drastically ramp up its response to protests over fuel prices, a spokesman for President Emmerson Mnangagwa told the Sunday News paper. Authorities claim three people have lost their lives in the unrest, but the activists say some 12 people were killed and scores of others suffered gunshot wounds in the brutal crackdown. Talking to the pro-government paper, spokesman George Charamba said the opposition MDC party and the trade unions had "unleashed" violence. Zimbabwe's government "will not stand by while such narrow interests play out so violently." Charamba told the Sunday News from Azerbaijan, where he is following the president on an official trip. "The response so far is just a foretaste of things to come," he added. The presidential spokesman also said the government would review some constitutional amendments adopted in 2013, which he said were being abused by its opponents. Zimbabwe's current president, Emmerson Mnangagwa, took office after the military pushed out long-reigning dictator Robert Mugabe 14 months ago. However, the Mnangagwa administration has made little progress in granting political freedoms or boosting the economy. Less than a week ago, Mnangagwa announced a sharp hike in gas and petrol prices, which made gasoline in the impoverished country the most expensive in the world. He then left for the World Economic Forum in Davos, leaving his vice president, former military leader, Constatino Shiwenga to deal with the subsequent unrest. On Sunday, Mnangagwa said he would be returning home, without going to Davos, where he would be replaced by Minister of Finance Mthuli Ncube. The government's response has been strongly criticized, with UN officials slamming the "excessive use of force." The authorities ordered two internet shutdowns and a partial block of social media. Some 700 activists were reportedly arrested, including several lawmakers from the opposition MDC party and the prominent Mugabe critic, pastor Evan Mawarire. The pastor now faces a charge of subversion which is punishable by up to 20 years in prison. He said it was "heartbreaking" to see the new government act similar to the regime of Robert Mugabe. Speaking to the Sunday Times from Azerbaijan, presidential spokesman George Charamba accused MDC leaders of seeking power "on the blood of the Zimbabwean people"
"The MDC and its affiliate organizations will be held fully accountable for the violence and the looting," he said. A partial internet blackout was still in force on Sunday.